Installing the Windows Server 2003 iSCSI Software Initiator is the first step to setting up Microsoft Exchange iSCSI SAN storage. Learn how to do it. Many of the steps required to install and configure an initiator are going to depend on the type of initiator client you are using (hardware or software) as well as the iSCSI target. You are reading tip #3 from "iSCSI SAN storage for Microsoft Exchange -- 5 tips in 5 minutes," excerpted from Chapter 3 of the book "The Shortcut Guide to Exchange Server 2007 Storage Systems," by Jim McBee, copyright 2007, published by Realtimepublishers. The examples in this chapter will cover the steps necessary to use the Microsoft iSCSI Software Initiator. In the examples that require an iSCSI target, I am using a virtual machine running OpenFiler v1.1. OpenFiler is very easy to use and a great way to learn both NAS and SAN-based technologies; LUNs can be created for not only iSCSI initiators but also NFS, SMB/CIFS, FTP, and HTTP-based file access. You can download this virtual machine from openfiler.com. To better illustrate the configuration that I am using for the examples in this chapter, Figure 3.4 shows the initiator and target systems. The client or initiator system is an Exchange Server named SFOEX01 whose IP address is 192.168.15.254. The target system is an iSCSI SAN (in this case, running OpenFiler) whose IP address is 192.168.15.128. Figure 3.4 Example of an iSCSI system. Two volumes have been created on the target system and have been configured to be used with iSCSI clients. These volumes are for the Exchange database files and the Exchange transaction log files. 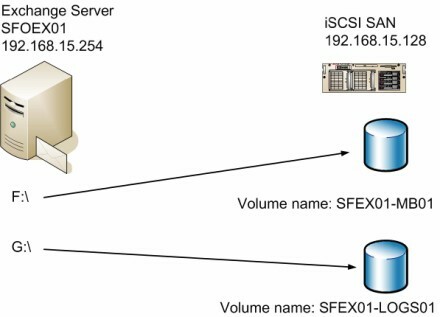 Create volumes on the iSCSI SAN and designate them as iSCSI volumes. Define iSCSI volume security (user name, password, and IP restrictions) for the iSCSI volumes on the iSCSI SAN. 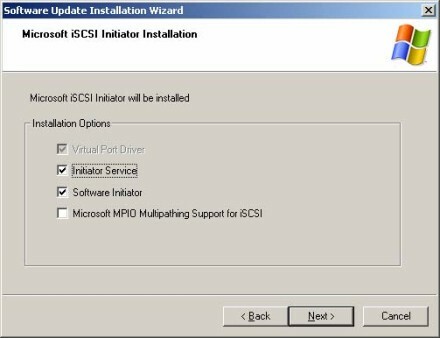 Install the iSCSI initiator client software on the Windows server. Connect the iSCSI initiator to the appropriate target LUNs on the iSCSI SAN. Partition and format the new volumes on the Windows server. Move the Exchange databases and transaction logs to the iSCSI LUNs. Before you install the first iSCSI initiator, you may want to install the Microsoft iSNS Server. iSNS is Internet Storage Name Service, which allows for management and control of iSCSI initiator clients that support a minimum of version 22 of the IETF iSNS draft standard. The iSNS Server installs as a Windows service and allows iSNS clients such as the Microsoft iSCSI initiator to register with the iSNS server and to locate other iSNS clients on the network. The software includes the iSNS service, a graphical user interface (GUI) that allows administration of most common iSNS server management tasks, a command-line interface for managing the iSNS server, and a Windows Management Instrumentation (WMI) interface for managing the iSNS server. The iSNS server is not necessary and is designed merely to make it easier to discover and manage iSNS clients. In the examples I am going through, I will not use the iSNS client component of the Microsoft iSCSI initiator. If you have more than two or three initiators and targets, the iSNS Server can simplify the discovery and management process. NOTE: See Microsoft's article "Microsoft iSNS Server 3.0" or search Microsoft's Web site for iSNS for more information. One of the first things that you have to do in order to use an iSCSI SAN is to install the iSCSI initiator software on your client computers. In the case of client computers, I mean the Windows servers that will be using iSCSI targets; this will almost always be your Windows servers. Unless your SAN or iSCSI network adapter vendor specifically instructs you to do otherwise, always use the latest version of the Microsoft iSCSI Software Initiator. This software can be downloaded from Microsoft's Web site. NOTE: For download links and more information about Microsoft's iSCSI Software Initiator, see Microsoft's article "Microsoft Storage Technologies – iSCSI." Download the correct build for your Windows Server platform; builds for the x86, x64 (AMD64), and IA64 platforms are available. The installer will have a name such as Initiator-2.04-build3273-amd64fre.exe. Run the initiator client installation on the Windows Server on which you want to install the software. You may have to confirm Run on the Open File - Security Warning dialog box once you run the executable. On the Microsoft iSCSI Initiator welcome screen, click Next. On the Microsoft iSCSI Initiator Installation box (shown in Figure 3.5), select the installation options. I recommend installing all the available options including the Microsoft MPIO Multipathing Support for iSCSI even if you don't plan to use it right away. When you have selected the desired options, click Next. On the License Agreement screen, review the End-User License Agreement, select the I Agree radio button, and then click Next. The installation may take a minute or two to run all the necessary processes and complete the installation, so be patient. Once the installation has completed, click Finish. Once you click Finish, the system will restart. One of the most important things to keep in mind is that anytime you install or update the iSCSI initiator software, make absolutely sure that you restart the system immediately after the installation completes. After reboot, you will have a new Control Panel applet available called the iSCSI Initiator (see Figure 3.6). This icon is also placed on the desktop. Figure 3.6 iSCSI Initiator Control Panel icon.